A vital part of a bridge design is the drainage system. Proper drainage increases safety and prolongs the lifetime of the bridge. EnviroDeck and EnviroBridge are simple and effective bridge drainage systems with advantages both during construction and throughout the lifetime of the bridge. sustainable overall concept - maintenance - life - protection. Water is discharged more quickly from the road surface, which makes it safer for the traffic and improves the life span of the bridge structure. Water from beneath the surface (which potentially damages the road and bridge) can be drained by means of a so-called sub-surface drain integrated in both systems. Main aspect of the design is the continuous array of openings in the kerb along the road. Which carry most of the water out before it can penetrate into the ground. A second set of openings under the road surface prevents excessive tension of water that was absorbed by the (Poreous Asphalt Cocrete) asphalt. The integrated channel in the unit drains the water. Envirobridge and EnviroDeck carry both the water of the road surface as the so-called sub-surface water quickly and effectively off. The specially formulated material provides a smooth surface that the water quickly drains. Both EnviroDeck as Envirobridge are lightweight and hence can be installed quickly and easily by hand. Envirodeck and Envirobridge both class D400 units meet EN1433 and have a high impact strength. A vital part of the bridge design is the BRIDGE-DRAINAGE. Yes, I'm curious how Bridge Drainage's products deliver a saving in my project. I would like to receive a free calculation. Bridge drainage made from a durable composite consisting of calcium and high quality PE recyclate. Available in concrete look and Anthracite. Standard in 10 different widths and heights. RWS sloping profile and standard straight profile available. Taylor made the EnviroBridge can be adapted to any type of roadway. The heights and widths of the drainage openings are variable. The elements are in accordance with EN1433 class D400. The units are equipped with drainage holes 3 per half meter element - the number of openings and their shape can be produced to customer specification. Drainage system for sub-surface rainwater. The full bridge or portions - bottleneck- can be equipped with this system consisting of elements of 1000mm, t-pieces - crosses and drain wells. 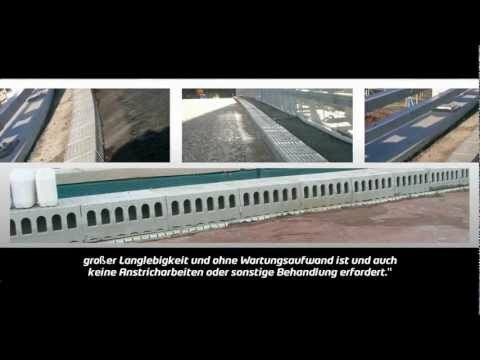 The goal is the protection of the asphalt and the bridge coating / membrane using a continuous drainage of rainwater, situated between the bridge coating / membrane and asphalt. The drideck system can be combined with envirodeck and envirobridge. 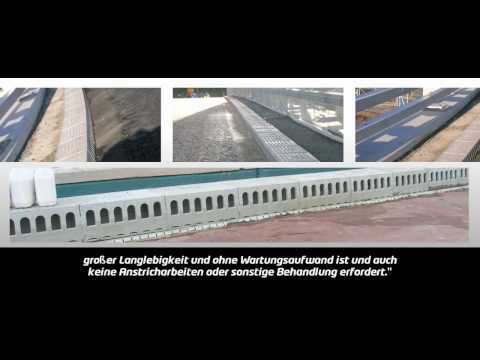 Often the bridge-eaxpansion joints can be a bottleneck regarding the drainage - on these points drideck can be a solution by draining parallel to the bridge expansion and integrate the drideck system. Discover how alternative drainage within your project is possible! This solution is speciale designed according to the specific requirements and wishes of the australian road authority.